Regardless of what the vSphere host Advanced Setting Disk.MaxLUN has stated as its definition for years, “Maximum number of LUNs per target scanned for” is technically not correct. In fact, it’s quite misleading. The true definition looks similar stated in English but carries quite a different meaning and it can be found in my SnagIt hack above or within VMware KB 1998 Definition of Disk.MaxLUN on ESX Server Systems and Clarification of 128 Limit. The Disk.MaxLUN attribute specifies the maximum LUN number up to which the ESX Server system scans on each SCSI target as it is discovering LUNs. If you have a LUN 131 on a disk that you want to access, for example, then Disk.MaxLUN must be at least 132. Don’t make this value higher than you need to, though, because higher values can significantly slow VMkernel bootup. The 128 LUN limit refers only to the total number of LUNs that the ESX Server system is able to discover. The system intentionally stops discovering LUNs after it finds 128 because of various service console and management interface limits. Depending on your setup, you can easily have a situation in which Disk.MaxLUN is high (255) but you see few LUNs, or a situation in which Disk.MaxLUN is low (16) but you reach the 128 LUN limit because you have many targets. 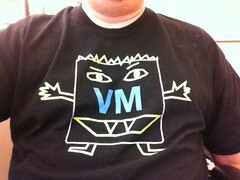 For more information about limiting the number of LUNs visible to the server, see http://kb.vmware.com/kb/1467. Note the last sentence in the first paragraph above in the KB article. Keep the value as small as possible for your environment when using block storage. 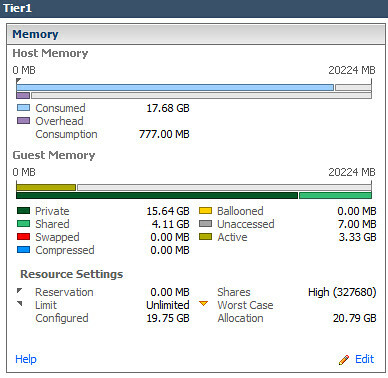 vSphere ships with this value configured for maximum compatibility out of the box which is the max value of 256. Assuming you don’t assign LUN numbers up to 256 in your environment, this value can be immediately ratcheted down in your build documentation or automated deployment scripts. Doing so will decrease the elapsed time spent rescanning the fabric for block devices/VMFS datastores. This tweak may be of particular interest at DR sites when using Site Recovery Manager to carry out a Recovery Plan test, a Planned Migration, or an actual DR execution. It will allow for a more efficient use of RTO (Recovery Time Objective) time especially where multiple recovery plans are run consecutively. Here’s a discussion that has somewhat come full circle for me and could prove to be a handy for those with lab or production environments alike. A little over a week ago I was having lunch with a former colleague and naturally a TPS discussion broke out. We talked about how it worked and how effective it was with small memory pages (4KB in size) as well as large memory pages (2MB in size). The topic was brought up with a purpose in mind. As legacy Windows platforms were slowly but surely replaced by their Windows Server 2008, R2, and now 2012 predecessors, something began to happen. Consolidation ratios gated by memory (very typical mainstream constraint in most environments I’ve managed and shared stories about) started to slip. Part of this can be attributed to the larger memory footprints assigned to the newer operating systems. That makes sense, but this only explains a portion of the story. The balance of memory has evaporated as a result of modern guest operating systems using large 2MB memory pages which will not be consolidated by the TPS mechanism (until a severe memory pressure threshold is crossed but that’s another story discussed here and here). For some environments, many I imagine, this is becoming a problem which manifests itself as an infrastructure capacity growth requirement as guest operating systems are upgraded. Those with chargeback models where the customer or business unit paid up front at the door for their VM or vApp shells are now getting pinched because compute infrastructure doesn’t spread as thin as it once did. This will be most pronounced in the largest of environments. A pod or block architecture that once supplied infrastructure for 500 or 1,000 VMs now fills up with significantly less. So when I said this discussion has come full circle, I meant it. A few years ago Duncan Epping wrote an article called KB Article 1020524 (TPS and Nehalem) and a portion of this blog post more or less took place in the comments section. Buried in there was a comment I had made while being involved in the discussion (although I don’t remember it). So I was a bit surprised when a Google search dug that up. It wasn’t the first time that has happened and I’m sure it won’t be the last. Back to reality. After my lunch time discussion with Jim, I decided to head to my lab which, from a guest OS perspective, was all Windows Server 2008 R2 or better, plus a bit of Linux for the appliances. Knowing that the majority of my guests were consuming large memory pages, how much more TPS savings would result if I forced small memory pages on the host? 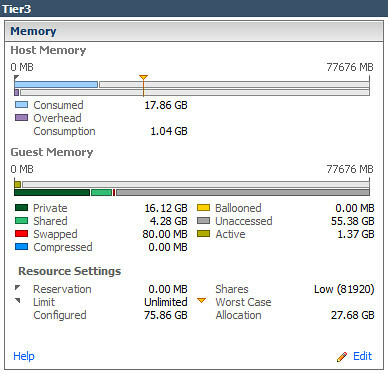 So I evacuated a vSphere host using maintenance mode, configured Mem.AllocGuestLargePage to a value of 0, then placed all the VMs back onto the host. Shown below are the before and after results. So for those of you who may be scratching your heads wondering what is happening to your consolidation ratios lately, perhaps this has some or everything to do with it. Is there an action item to be carried out here? That depends on what your top priority when comparing infrastructure performance in one hand and maximized consolidation in the other. Those who are on a lean infrastructure budget (home lab would be an ideal fit here), consider forcing small pages to greatly enhance TPS opportunities to stretch your lab dollar which has been getting consumed by modern operating systems and and increasing number of VMware and 3rd party appliances. That said, I’d be curious to hear if anyone in the community disables large pages in their environments as a regular habit or documented build procedure and what the impact has been if any on both the memory utilization as well as performance. Last but not least, Duncan has another good blog post titled How many pages can be shared if Large Pages are broken up? Take a look at that for some tips on using ESXTOP to monitor TPS activity. Update 10/20/14: VMware announced last week that inter-VM TPS (memory page sharing between VMs, not to be confused with memory page sharing within a single VM) will no longer be enabled by default. This default ESXi configuration change will take place in December 2014. Administrators may revert to the previous behavior if they so wish. ESXi 5.5 Patch 3. For more information, see VMware ESXi 5.5, Patch ESXi550-201410401-BG: Updates esx-base (2087359). The divergence is in response to new research which leveraged TPS to gain unauthorized access to data. Under certain circumstances, a data security breach may occur which effectively makes TPS across VMs a vulnerability. Although VMware believes the risk of TPS being used to gather sensitive information is low, we strive to ensure that products ship with default settings that are as secure as possible. Details: FEATURED SPEAKER: Joseph Hand, Sr. Director of Product Strategy, AppAssure Software. Learn about the 3 Backup & Recovery technologies you need for 2012! Instant Restore with near-zero RTO, Backup and Recovery auto-verification, and Cross-platform Data Recovery – P2V, V2V, V2P. VMware has unveiled a point release update to several of their products tied to the vSphere 5 virtual cloud datacenter platform plus a few new product launches. vCenter 5.0 Update 1 – Added support for new guest operating systems such as Windows 8, Ubuntu, and SLES 11 SP2, the usual resolved issues and bug fixes, plus some updates around vRAM limits licensing. 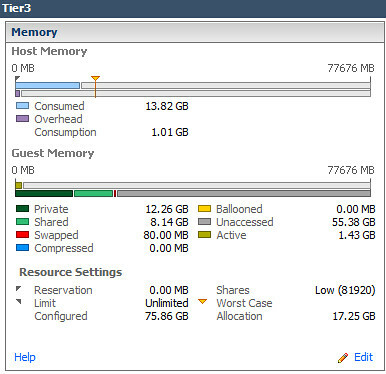 One other notable – no compatibility at this time with vSphere Data Recovery (vDR) 2.0 according to the compatibility matrix. ESXi 5.0 Update 1 – Added support for new AMD and Intel processors, Mac OS X Server Lion, updated chipset drivers, resolved issues and bug fixes. One interesting point to be made here is that according to the compatibility matrix, vCenter 5.0 supports ESXi 5.0 Update 1. I’m going to stick with the traditional route of always upgrading vCenter before upgrading hosts as a best practices habit until something comes along to challenge that logic. vCloud Director 1.5.1 – Added support for vSphere 5.0 Update 1 and vShield 5.0.1, plus RHEL 5 Update 7 as a supported server cell platform. Enhancements were made around firewall rules, AMQP system notifications, log collection, chargeback retention, resolved issues, and added support for AES-256 encryption on Site-to-Site VPN tunnels (unfortunately no vSphere 5.0 Update 1 <-> vCloud Connector 1.5 support). Oh yes, sometime over the past few months, VMware Marketing has quietly changed the acronym for vCloud Director from vCD to VCD. We’ll just call that a new feature for 1.5.1 going forward. I <3 the Marketing team. Site Recovery Manager 5.0.1 – Added support for vSphere 5.0 Update 1 plus a “Forced Failover” feature which allows VM recovery in cases where storage arrays fail at the protected site which, in the past, lead to unmanageable VMs which cannot be shut down, powered off, or unregistered. Added IP customization for some Ubuntu platforms. Many bug fixes, oh yes. VMware brought back an advanced feature which hasn’t been seen since SRM 4.1 which provided a configurable option, storageProvider.hostRescanCnt, allowing repeated host scans during testing and recovery. This option was removed from SRM 5.0 but has been restored in the Advanced Settings menu in SRM 5.0.1 and can be particularly useful in troubleshooting a failed Recovery Plan. Right-click a site in the Sites view, select Advanced Settings, then select storageProvider. See KB 1008283. Storage arrays certified on SRM 5.0 (ie. 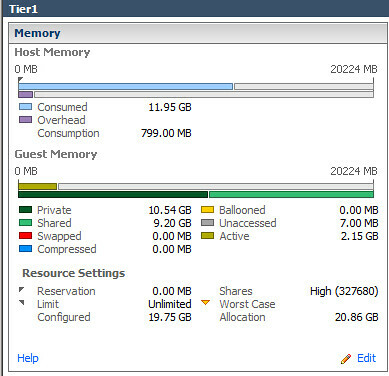 Dell Compellent Storage Center) are automatically certified on SRM 5.0.1.
vShield 5.0.1 – Again, added support for vSphere 5.0 Update 1, enhanced reporting and export options, new REST API calls, improved audit logs, simplified troubleshooting, improved vShield App policy management as well as HA enhancements, and enablement of Autodeploy through vShield VIB host modules downloadable from vShield Manager. There are a lot of versions in play here which weaves somewhat of a tangled web of compatibility touch points to identify before diving head first into upgrades. I think VMware has done a great job this time around with releasing products that are, for the most part, compatible with other currently shipping products which provides more flexibility in tactical approach and timelines. Add to that, some time ago they’ve migrated a two dimensional .PDF based compatibility matrix into an online portal offering interactive input making the set of results customized for the end user. The only significant things missing in the vSphere 5.0U1 compatibility picture IMO are vCloud Connector, vDR, and based on the results from the compatibility matrix portal – vCenter Operations (output showed no compatibility with vSphere 5.x, didn’t look right to me). 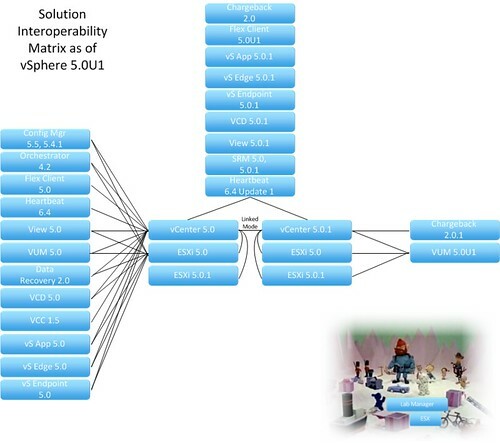 I’ve taken a liberty in creating a component compatibility visual roadmap including most of the popular and currently shipping products vSphere 5.0 and above. If you’ve got a significant amount of infrastructure to upgrade, this may help you get the upgrade order sorted out quickly. One last thing – Lab Manager and ESX customers should pay attention to the Island of Misfit Toys. In early 2013 the Lab Manager ride comes coasting to a stop. Lab Manager and ESX customers should be formulating solid migration plans with an execution milestone coming soon. I receive a lot of communication from recruiters, some of which I’m allowed to share, so I’ve decided to try something. On the Jobs page, I’ll pass along virtualization and cloud centric opportunities – mostly US based but in some cases throughout the globe. Only recruiter requests will be posted. I won’t syndicate content easily found on the various job boards. If you’re currently on the bench or looking for a new challenge, you may find it here. Don’t tell them Jason sent you. I receive no financial gain or benefit otherwise but I thought I could do something with these opportunities other than deleting them. Best of luck in your search. In case you missed the link, the Jobs page.